So I am a little bit of a christmas nut. It's my Dad fault he made christmas magic for us every year, then we talked about it all year long. He even keeps a christmas journal! We tease him but really he has made it so that even in my adult life I feel like each year Santa is going to come down the chimney and bring me everything I wished for. This year all my little people are old enough to understand Santa and I am so excited to fill them with the magic. 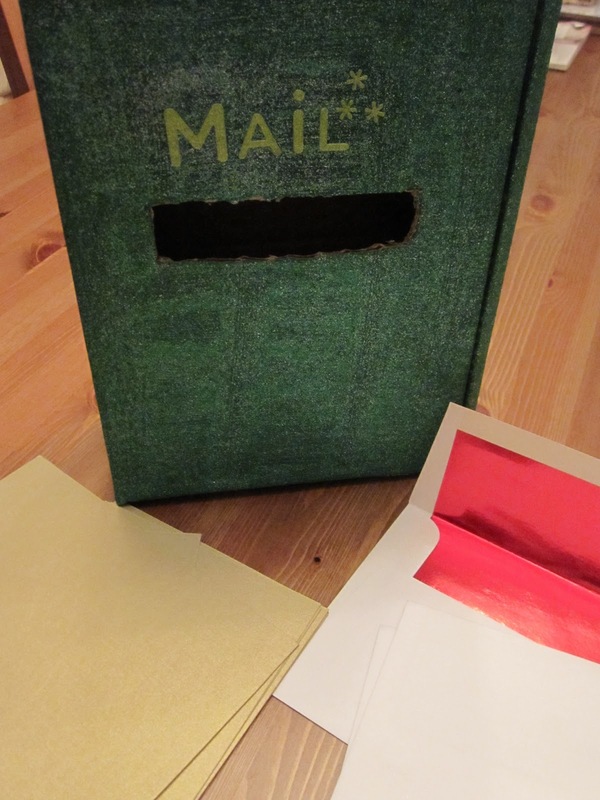 My little man loves getting the mail with me so I came up with the idea to make our own mail box and let the kids write letters to Santa. All I did was take an old box, paint it with glitter paint and apply some letter stickers I already had. Then I found some left over envelops and card stock that look christmassy and the kids will be able to write letters to Santa and mail them. I made a little door at the back of the box because I know they will want to be able take the mail in and out a few times. I'm just going to set them up with the supplies and see where they take it. I will be posting more christmas fun as we get closer to the big day! I'm trying not to go over board but already my head is spinning with idea's. I would love to know what you are planning for christmas activities or what traditions you already have. Adorable craft. I am blog hopping and found your blog. I'm a new follower! Would love for you to check out my blog and follow back!